Buff, dry, or dust without scratching! The Supreme Large Microfiber Towel is a generous 16 x 24 inches, making it ideal for buffing and drying your vehicle. This thick microfiber towel feels too luxurious to be a detailing towel! Wipe off quick detailers. Buff away smudges and fingerprints. The Supreme 530 Large Microfiber Towel is versatile and, most importantly, safe on every automotive surface. The Supreme 530 Large Microfiber Towel gets its name from its incredible thickness. Microfiber weight is expressed in "grams per square meter" or g/m2. The thickness of a microfiber towel is directly related to its weight. Higher weight = higher density = a thicker towel. At 530 g/m2, the Supreme 530 Microfiber Towel is incredibly thick and plush! The Supreme 530 Large Microfiber Towel can handle any detailing job. This ultra plush, ultra thick towel has a soft touch to pamper your vehicle as it buffs away waxes, polishes, and quick detailers. The unique blend of 75% polyester and 25% polyamide gives the towel a balance of softness and toughness to perform any detailing task. Buff paint, dust the interior, clean glass, and dry your vehicle. The Supreme 530 Large Microfiber Towel is soft and effective on any surface. The Supreme 530 Large Microfiber Towel is composed of millions of manmade fibers, each 100 times smaller than a human hair! 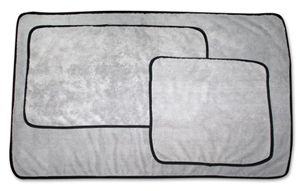 More than 250,000 of these micro fine fibers per square inch compose this incredibly soft, plush fabric. The Supreme 530 Large Microfiber Towel is an outstanding buffing towel. The thick towel feels as soft as the finest chenille. It glides over the paint, grabbing dust and massaging the paint to a brilliant shine. The nap is deep enough to pull light dust and dirt away from the paint surface where it cannot scratch. The microfiber-covered hem and removable tag further ensure a swirl-free detail. The size and thick weave of theSupreme 530 Large Microfiber Towel make it an outstanding drying towel. The split-weave microfiber locks away moisture. Choose the right size Supreme 530 Microfiber Towel to suit your detailing needs. The Supreme 530 Large Microfiber Towel has a dust-attracting magnetism. Use the towel for dry dusting and watch how it grabs dust right off the surface. The powerful magnetic charge holds the dust so it’s completely removed from the surface. Plus, the Supreme 530 Large Microfiber Towel is lint-free. You have to sink your hand into the Supreme 530 Large Microfiber Towel to feel the difference! Your vehicle has never experienced a towel like this. Use it for dusting, buffing, quick detailing, cleaning, and polishing. No job is too big for the Supreme 530 Large Microfiber Towel!